More than 78,299,866 beer lovers served! Thanks to Milena at Harvey Distributing (Dublin CA) for the bottles! Milena says that the brewery changed ownership and brewing equipment around 1994, and it sure seems to have made a difference. There's nothing like nice fresh beer! 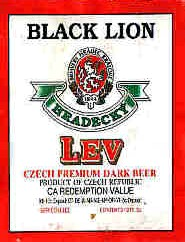 They're now brewed at Měšťanský Pivovar Havličkův Brod. Dark red, clear, OK head. Sweet, spicy, toffee aroma. Sweet flavor, OK body. Some dark malt flavor. Some bitterness in finish, doesn't last long. Pretty clean beer. Deep golden, fairly high carbonation, good head. 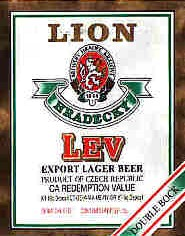 Malty aroma, sweet and spicy Saaz. Great bitterness and Saaz flavor! Fairly light body, but sweet, with noticeable alcohol. Finishes very clean. Nice fresh beer. 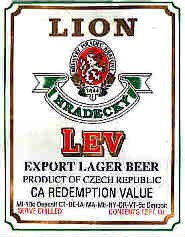 Compare this to the 1994 draught version. Yellow, clear. Not many bubbles. Faintly soapy aroma? Excellent body. Tastes soapy, though. Wonder if it's the glass? Stale hops flavor. Stale beer? Bah! Golden, good carbonation and head. Malty-sweet aroma. Very smooth, fairly alcoholic, faintly metallic. Pretty well-balanced overall.